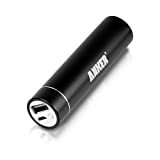 I saw the Anker® Astro Mini 3000mAh Ultra-Compact Portable Charger Lipstick-Sized External Battery Power Bank Pack on Amazon. It's obviously a battery inside this thing. But what is really inside it? I'm interested in knowing whether it is a 18650 lithium ion battery, because I have quite a few of those. That means I can swap the battery in and out. But the 18650 is only 3.3 volts. Is 3.3 volts sufficient to charge a phone via the USB port, which is usually 5 volts? So that raises some more questions, like whether this thing steps the 3.3v (assuming it has a 18650) up to 5v? Anyway, has anyone taken apart or disassembled the Anker Astro Mini External Battery Pack? Please let us know what's inside it. Thanks. I have a RavPower lipstick charger and it looks just like this. It's great that I carry it without any notice.